Hub and Megan Corbett like to think they are a perfect complement of horsemanship. Hub is a cowboy who loves to team rope, start colts, and train any just about anything with four legs. Megan is an eventer who loves to compete and sell off the track Thoroughbreds. Together, they use the best of both English and Western training techniques to encourage each horse and student toward their highest potential. Hub has been starting horses since he was a young boy in Georgia. He also rode bulls and bucking horses into his 20's. His attention later turned to team roping, where he successfully competed as a heeler in Australia and Tennessee. Hub has taught people about horsemanship for years in camp and lesson barn environments. After riding countless horses and teaching countless students, his love for learning still continues. Hub's calm, assertive and kind spirit make him a trusted trainer, husband and friend. As a child in California, Megan was a founding member of the Pacific Ridge Pony Club. She leased horses through high school and later, while attending college at Cal Poly, San Luis Obispo, worked at a small Dutch Warmblood breeding farm. In 2004, she moved to Tennessee and found a job working at a lesson barn where she taught lessons and rode young horses. It was at this barn she met Hub, who was the current Western riding instructor and colt starter. They fell in love in a sandy arena while sharing their hearts on horseback. The couple was married in October of 2006. To further her equine education, in 2008 Megan spent time at Meadow Run Farm in Florence, AL as a working student for international event riders Jim Graham and David Adamo. Megan then trained with event rider Amy Wise of Columbia, TN. In 2010, Megan joined Hub as a full time horse trainer. 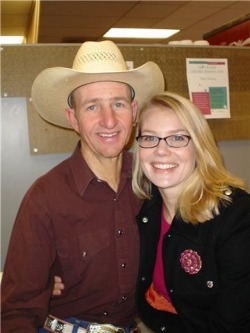 Hub and Megan moved to Kentucky in 2012 when Hub's employer, Gabe Reynolds Cutting horses, moved their operation to Rocky Fork Feeders and Arena in Shelbyville, KY. During his time with Gabe, Hub enjoyed learning the ins and outs of training a successful cutting horse and the opportunity to enter the show arena. He is now employed driving fuel tankers for Thortons Transportation and helps Megan train the young horses in the barn. Megan trained with Mary Fike, long time organizer and XC course designer of several horse trials held at the Kentucky Horse Park. Then she spent the winter of 2013 training with WEG silver medalist, Dorothy Crowell, in Ocala, FL and continued working for her at her Sycamore Hill Farm in Frankfort, KY through 2014. Now, the couple lives in Upton, KY located an hour south of Louisville in the rolling hills of Larue County.